Social networking has become a key way for attorneys to generate firm awareness and make connections that lead to referrals and new business. The WEB 2.0 Marketing Guide helps you navigate the Social Media maze and help drive business. Designed to jump start an inactive marketing program or get one started where there never was one. Perfect for partners and associates who have little or no experience in marketing, or who simply want to break through to the next level of business development. 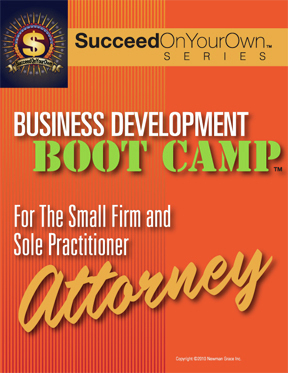 The BUILD YOUR LAW PRACTICE™ Marketing Tool Kit from SucceedOnYourOwn™ contains BOTH the WEB 2.0 Marketing Guide™ and the Business Development BOOT CAMP™. It also includes the Advanced Marketing Tool Kit™. This is an easy-to-follow, step-by-step program that will let you brand your firm, focus on the right audience, and develop an ongoing stream of referrals. Useful tips that can help you persuade and win in any venue. How to become a power networker while building mutually beneficial relationships.